It should come as no surprise that the OMB is promoting Robotic Process Automation (RPA) as a solution, because advanced RPA software – what we refer to as intelligent digital workers – delivers a triple win. RPA can quickly return those tens of thousands of wasted hours back to the agencies by eliminating repetitive, time-consuming activities – e.g., filling out forms and gathering required data housed in different systems – from processes and tasks. In fact, a recent Everest Group blog stated that organizations are achieving up to a 63 percent increase in process accuracy, up to a 58 percent reduction in process cycle time, and up to a 41 percent improvement in staff productivity. Lack of speed and process inefficiencies are two of the primary reasons citizens are dissatisfied with how the government delivers services. Citizens themselves believe technology is key to fixing these problems. Indeed, according to a 2017 Accenture Public Service Citizen survey, seven in 10 citizens feel that public agencies could provide a better customer experience by using the latest technologies. As an example, one of our Federal government clients, which provides financial management and procurement services, reduced contract invoicing and processing time from an average of two days to just 45 minutes. A 2017 survey conducted by Knowledge Capital Partners on Blue Prism’s behalf found that 86 percent of respondents reported that employee satisfaction improved with the introduction of Blue Prism robots. This is understandable, as digital workers remove burdensome, repetitive tasks from employees’ workloads, enabling them to focus on tasks requiring emotional intelligence, reasoning, judgment, and direct customer interaction. What steps should your agency take in moving ahead with RPA? According to Deloitte’s 2018 Global RPA survey, 53 percent of respondents have already started their RPA journey, and this is expected to increase to 72 percent in the next two years. With such high adoption rates, there are many use cases from which your agency can learn about the benefits, challenges, and approaches. But there’s also a lot of vendor-driven noise and hype in the marketplace. Here are critical questions we recommend you carefully consider – a blueprint, of sorts – on how to approach RPA to achieve maximum success. What Robotic Operating Model (ROM) – centralized, decentralized, federated, etc. – will work best for your agency? What processes should you automate? Which Blue Prism Certified implementation partner is right for your agency? How will you evangelize the changes to empower your employees? How will you involve your compliance and information security team? What roles and responsibilities should you assign to your team members? 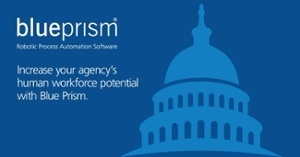 To learn more about how Blue Prism is enabling government agencies to digitally transform, please visit https://www.blueprism.com/gov, or reach out to me directly at michael.mcgeehan@blueprism.com.